This 61-acre Department-owned impoundment is in the Hidden Valley Wildlife Management Area in Washington County. Hidden Valley Lake is located in the mountains at about 3,500 feet of elevation. The south side of the lake is almost completely forested, and the north side is a mixture of woods and open lands. These open lands provide good bank access for anglers. 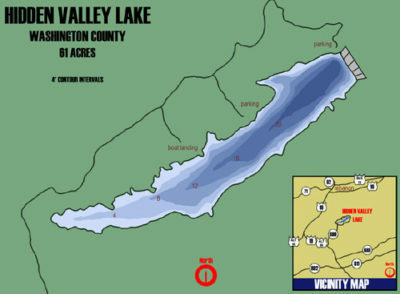 Hidden Valley Lake supports populations self-sustaining populations of largemouth bass, bluegill, redbreast sunfish, and black crappie. Channel catfish and northern pike are stocked. Fishing opportunities at Hidden Valley Lake are much improved compared to the late 1990’s. Stockings of largemouth, bluegill and northern pike effectively reduced the over-abundance of redbreast sunfish that was a problem in the past. Largemouth bass are increasing in both size and abundance, and are now reproducing in the lake. Bluegill have replaced redbreast sunfish as the dominant sunfish species. Black crappie are very abundant, but stunted at a small size. Most of the crappie collected in samples are less than 8 inches long. A few nice crappie up to 15 inches have been collected, but they are rare. Channel catfish and northern pike are stocked each year. These two species offer anglers some diversity. Overall the fishery appears to be improving. Gasoline motor use is prohibited. No camping is allowed within 100 yards of the lake shoreline. A concrete boat ramp is available for launching. A pit toilet is available from April through October.